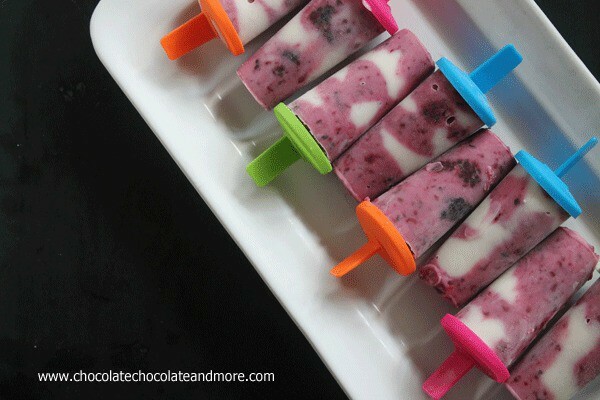 Blackberry and Vanilla Yogurt Swirled Popsicles - Chocolate Chocolate and More! Popsicles are the end all be all for easy summertime treats. You go to the dollar store and buy (for $1.00) a popsicle mold. Then you let the fun begin. It’s really about eating something frozen on a stick. You know I love my sugar but I do try to sneak a little healthy into my kids snack time. 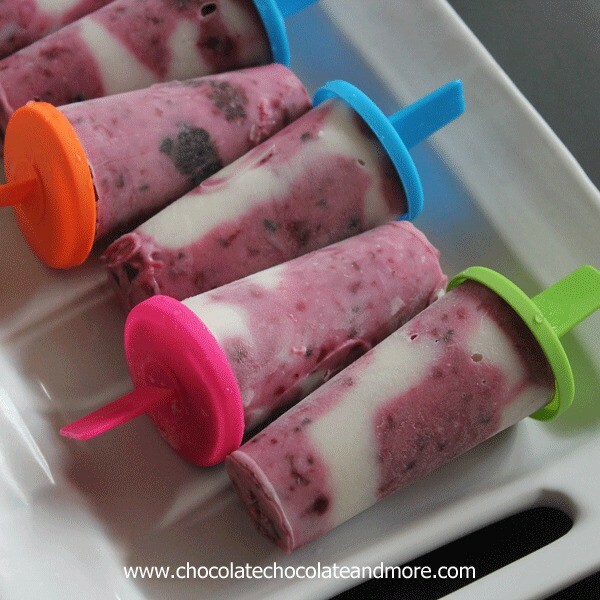 I could tell you I went out into the back yard and picked fresh blackberries (they are growing) but I can’t get to them before my youngest and she eats them as she picks, so it’s frozen for these pops. I have to tell you, these pops just made me smile while taking the photos. My cheap Dollar Store mold with the bright colored sticks. I wanted to be a kid again, carefree during the summer, nothing to worry about except swimming, riding my bike and playing with friends. Things are a little different these days but popsicles are still a summertime must have. I’ll ignore the fact that my teenage son was on his Xbox when I offered him one of these and relish in the fact that he put his remote down so he could have one in each hand. Combine about half of the yogurt in a medium bowl with berries. Using a fork, mash together berries and yogurt enough to color the yogurt but still leave chunks of fruit. 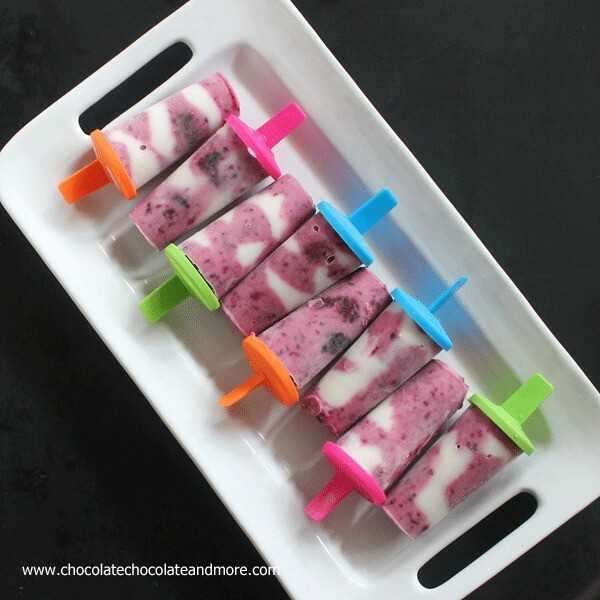 Alternating, spoon berry yogurt and plain yogurt into popsicle molds. Looking for more popsicle fun? 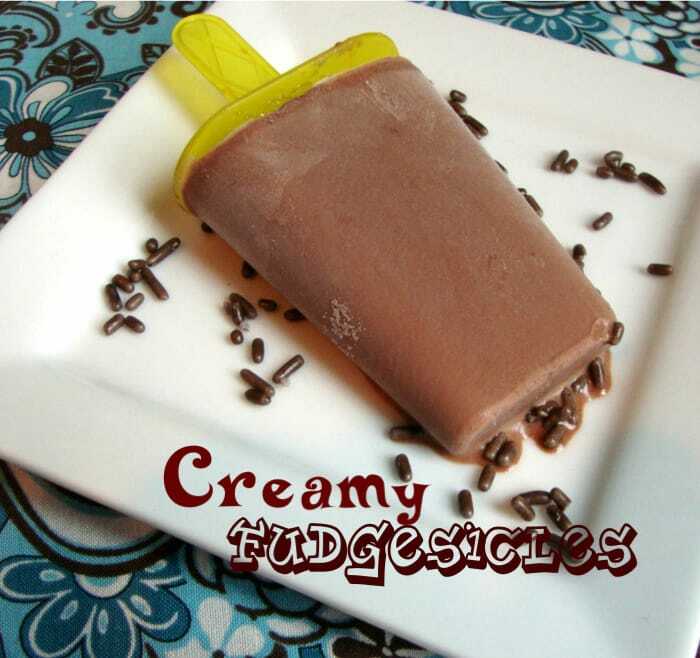 What a ‘cool’ idea for a good frozen treat. I have been making the watermelon ones for hubby, now I’m thinking of switching up to a creamy treat. A little variety plus it’s healthy too, thanks for sharing. Kids do have it made don’t they? My kids devour popsicles! I generally don’t mind them, but if I can make my own, then even better! Love these Joan! These sound awesome! I love frozen treats for the summer! Blackberry is a huge favorite at our house…and my daughter has been looking for “good for you” cold treats. 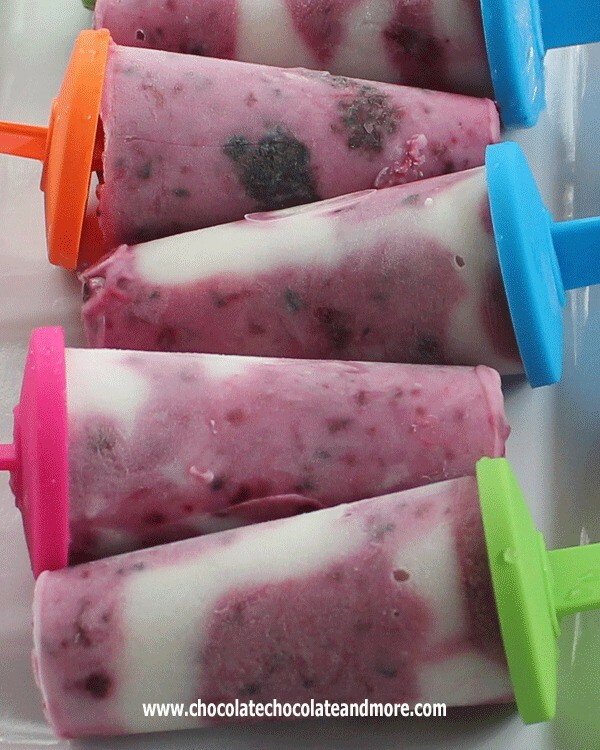 The perfect summer snack for my kids! YES! I cannot wait to make these with my girls!! Those look so yummy! I bet my kids would love them. Stopping by from weekend-wonders. Ohh yum!!! These look so good and refreshing!!!!!!!! 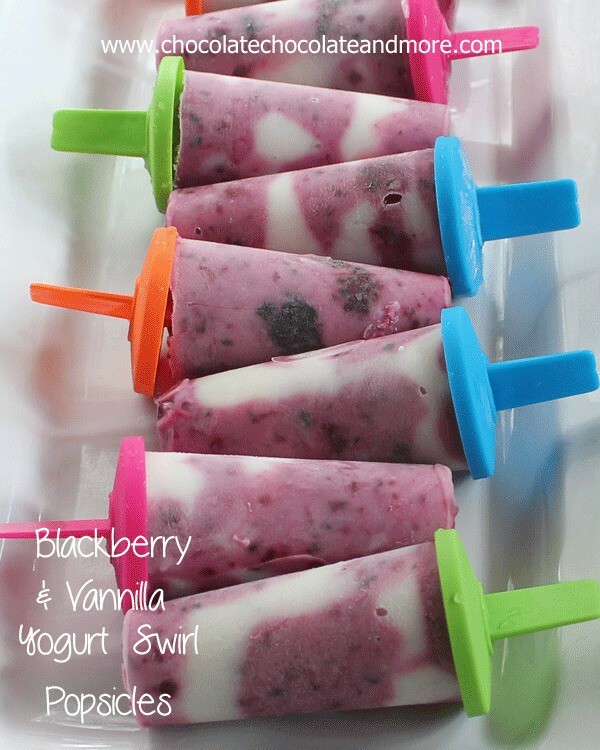 I used to pick wild blackberries as a child – these look so delish!! Pinned to our group linky party pinboard – thanks so much for linking your yummy popsicle recipe up last week! 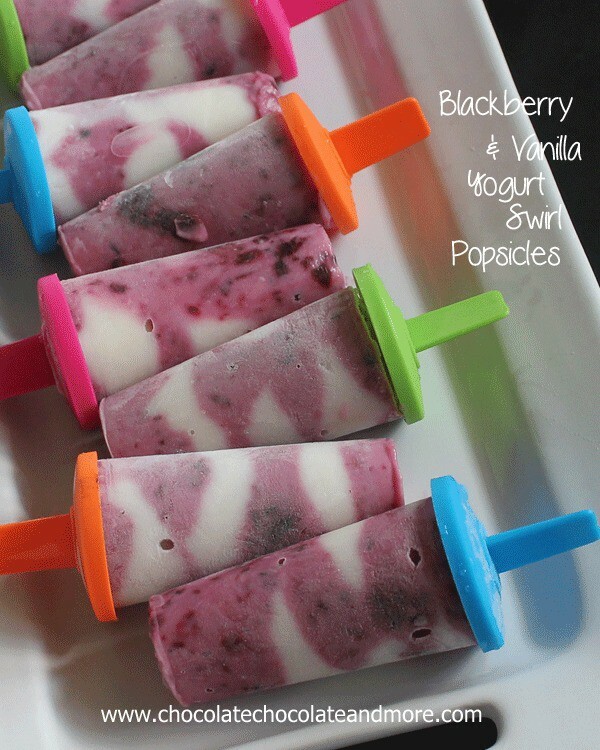 Oh how I love blackberries…and the ease of making these yummy treats…and the addition of the healthy yogurt…and…and…thanks so much for sharing at Weekend Potluck. Hi! I made these using blueberries and they came out wonderful!! Thanks so much! !